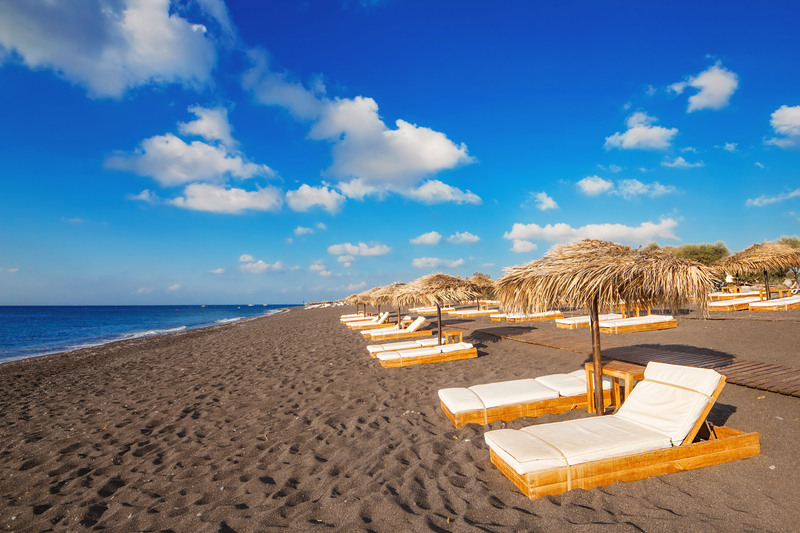 Being at the volcanic island do not miss an opportunity to visit the most famous and popular black sandy beach. It starts from the big mountain right from Perissa and goes all the way down to Perivolos and St. George, spreading for kilometers. This is a well protected from the strong northern winds place, loved by parents with children same much as by couples and young people coming to hang out in popular beach bars. You can find both a quiet and a noisy spot here, depending on your preferences. Water sports, mini golf, water park, beach volley, parasailing and paragliding, beach taverns and restaurants offering luxurious sun beds, umbrellas, drinks and food right on the beach, beach parties in the afternoon during the most busy summer months, cozy corners of the immense black sand without music and noise just for yourself, spacious hotels to all the budgets and tastes – all of that can be easily found in Perissa – Perivolos. In summer Perivolos is collecting the most glamorous public of the island being the most glamorous beach of Santorini. Except that, the Greeks always go here. Check yourself, it is very enjoyable! At the very beginning and the very end of the season, this beach is a very quiet and relaxing place loved by the locals. In fact, it offers you a real feeling of freedom, where you can enjoy in full the sand, the sea, and the sun. More than that, this beach almost everywhere offers a very smooth entrance into the sea – especially in Perivolos, which makes it the best spot to swim with children. As far as Perissa-Perivolos black beach is located in the South of Santorini, it makes it rather a big trip from the rest of the island to come here on your own using public bus transportation, especially if you are in Santorini just for a day. Including a visit to this beach into your island tour, taking a transfer or hiring a car saves much time and will make your day much more pleasurable.